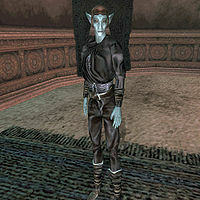 Salyni Nelvayn is a Dunmer nightblade who sells spells at the Morag Tong Guildhall in Ald'ruhn. She wears a common shirt with matching pants and shoes. She carries a leveled short blade and 30 gold. Also, there are only two other spell merchants who can sell you a Damage Fatigue effect. This page was last modified on 23 November 2018, at 07:22.